"For now, let's just say anything is possible...........including a tradable rally." If it weren't for Turkey Day, which from the traffic and stores is now Turkey Week, I would suggest that this rally has just about run its course. With 2 1/2 days to go this week, I suspect the rally might extend, although neither would I be surprised if a violent decline were to be in it's immediate future. In other words, sometimes I am more certain of the market's immediate path then at other times and this is one of those other times. What I am more certain of is that the Bear has not been broken and that lower, maybe much lower prices, still lay ahead. Maybe we all need a few days off, to spend with family and loved ones and to give thanks for the better times and special people who have crossed our paths this time around. 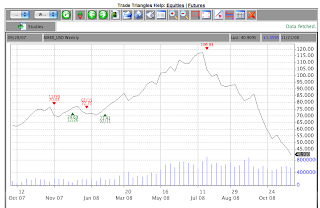 Let's start with the USO (Crude Oil ETF) Triangles Chart. I haven't been trading this one but want to include it here because it illustrates just how well the Triangle trading system works. 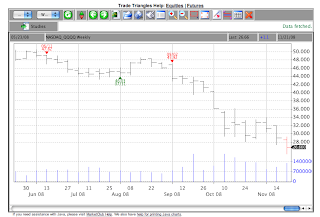 In roughly the past twelve months there have been five trades on the Weekly chart. The first three were all modest losers, whipsawed out of trades as Oil sought to establish a tradable trend. 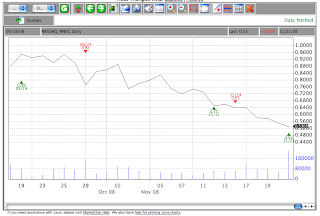 Then on February 11, 2008 a Buy Signal at 73.43. This was followed by a Sell signal on July 18th at 106.83. This Sell is still in effect today, with USO at 40.91. A few modest losses and then two grand slam home runs, back to back. What more can we realistically hope for in a mechanical trading system? Above is the chart of the QQQQ (Nasdaq 100 ETF). The Sell from September 2 at 45.92 is still in effect. I chose the bar chart for this format to point out that a Weekly Buy signal is far away, above the 32 level for this coming week. The Q's finished Friday at 26.66 so it would take about a 20% rally to trigger a Buy next week. Unlikely, but good to know just in case. Above is a Daily chart of NNVC. 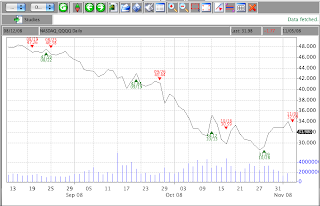 This stock is one of the few that I have found that trades much better on the Daily charts then the Weeklies. For what it's worth NNVC triggered a Buy this past Friday and if you were following the bar charts, you could have anticipated the Buy Triangle appearing upon a break-out on the Daily bars, which occurred on a spike up in price just after Friday's Open. The Triangles don't distinguish between spikes to new 3-period highs or modest pops above three-period highs. The beauty of a mechanical trading system is that there isn't much thinking involved. 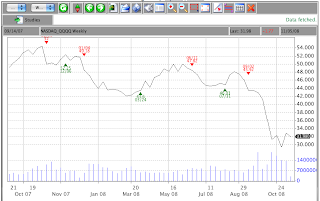 Above is a chart of GLD (Gold ETF) which triggered a Buy last week on the Weekly chart. I have just recently been following this Triangle chart because is appears to be doing a pretty good job of tracking the ups and downs in the price of Gold. Both GLD and SLV (Silver ETF) are tradables that can enter into huge price trends, both up and down, and like the USO chart above, represent other lucrative ways to trade a commodity, thus diversifying out of a trading portfolio of only stocks. 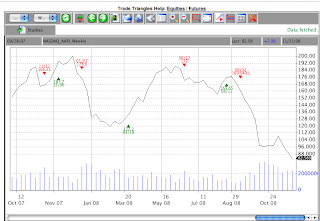 Finally, we have AAPL, which continues to trade very well under the auspices of the Weekly Triangle trading system. The pattern above is like many of the successful Triangle studies, modest whipsaws followed by huge trends followed by modest whipsaws followed by huge trends. Maybe half of the trades are losses, but the half that win more then compensate for those losses. I wrote last week that Friday and Monday should give us a clue as to whether a bottom was in. Despite the rally late Friday, the picture is far from clear. Now with Thanksgiving pending, it may not clear up until after the holiday. But as they say in the dance hall, lets dance with the one we came with. Since early September, all ambiguities in the market have resolved themselves to the downside. Until this pattern changes, I am favoring lower prices across the board and, believe it or not, maybe much, much lower prices. The primary trend of the market is DOWN and it is going to take more then a few hours (or even days) of robust buying to present a tradable bottom. When we go LONG we want to be buyers for weeks or months, not hours and days. We are not there yet. Today was quite the drama in the markets. The major averages fell through the 2002 lows like a bowling ball off the top ledge of the Sears tower in Chicago in a freezing rain storm on a raw, cold, November afternoon as the Chicago Bears were shut out by the Green Bay Packers 10-0. Yea, it was one of those days. What? Do you think I just make this stuff up? This is the first time since I published Crash Warning in early September that I thought that a bottom of any sorts was possible. The market will let us know more tomorrow (Friday, November 21) and Monday. For now, let's just say anything is possible...........including a tradable rally. My father was the investment guru of my entire extended family back in Detroit in the 1950's through 1987. That was an entire generation of splendid performance for him and anyone who listened to him, including, moi. Only thing was, my father only knew how to buy stocks. During those 35 odd years of investing, I think the only shares my father sold were to buy his family a house on Roselawn near Curtis in 1950 and then again to buy us a house in Southfield, Mi. in the mid-1960's. Although he tracked every stock he owned, every day, in a ruled spiral notebook, including a rather sizable margin balance, he just never sold. My father had never heard of R.N. Elliott, nor of Robert Prechter (until I brought him to my father's attention in the mid-1980's). But he was investing exactly as those two gentlemen would have suggested he invest at the time. This is a chart from Robert Prechter's, Conquer the Crash (extended samples reviewable through Google Books). Look at the years that my father was Mr. Buy & Hold. 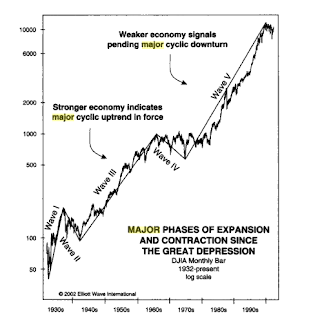 From about 1940 through his death in 1987, he rode the waves, first a Wave III, then he held through the sideways Wave IV and then through the first half of Wave V.
Here is a another perspective showing how my father was fully margined and invested during major phases of expansion and growth in the U.S. Economy. Note how throughout most this entire time stock prices went up, a little sideways, and then mostly straight up again. From this perspective, Buying & Holding from the late 1940's on was the only game in town and my father, through insight or just plain dumb luck, rode the waves up like the champion surfer that he was, always in, always fully invested, always on his board waiting for the big one. He didn't have the benefit of these charts, nor was he a proponent of The Wave Principle. He was just at the right place, with the right attitude and at the right time. When it comes to investing, it just doesn't get better then that. Or does it? Take another look at the last chart above. 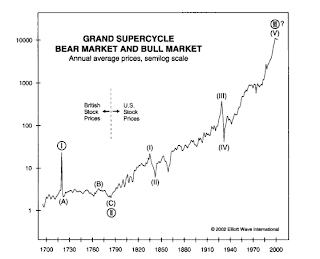 It it a Grand Supercycle Chart of the entire 300 year bull market, roughly correlating to the rise of America on the global scene. 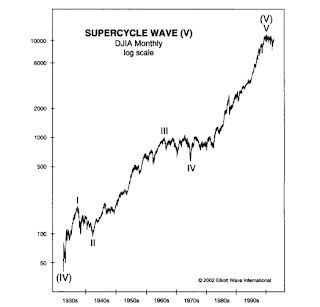 If the Wavesters are correct that this Grand Supercycle Degree Bull Market has ended and that we are in a "Wave 4" correcting the nearly 300 year advance, where is this market going? Yes, that's right, under 1000 on the DJIA. Whether or not we get that low, if one accepts the basic tenants of Elliott Wave theory, that social mood drives society and that social mood can be measured with uncanny accuracy by stock prices, there's trouble ahead in River City (and all other cities). The perfect investment stance then is the exact opposite of my father's steady Buy & Hold brilliance on the way up. That would be taking a Sell & Hold position for the ride down (or at least that part of the ride down we will experience in our lifetimes). "Sarah and Alana, if you are reading this after my time is up, remember what your grandfather built for you and your Dad. Now look back on your Dad's trading during the next 25 years and ask yourself, how did it work out? I suspect you will now know what to do with all that I have left you." As for you, my loyal readers, I recommend you learn this stuff. Just click on any of the Elliott Wave content on the right side of my Blog. Much of it is free. Some of it an incredible bargain ($20/month for Robert Prechter's Elliott Wave Theorist). For those of you who reject it just because of the seemingly outrageous conclusion, do yourself a favor and learn it first. Even if you still reject it, as events unfold in the years ahead, at least you'll know where it was first above written. 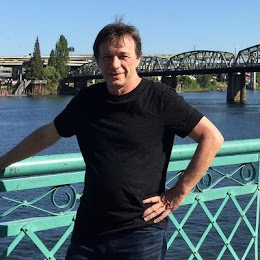 About NanoViricides: NanoViricides, Inc. (www.nanoviricides.com) is a development stage company that is creating special purpose nanomaterials for viral therapy. The Company's novel nanoviricide™ class of drug candidates are designed to specifically attack enveloped virus particles and to dismantle them. The Company is developing drugs against a number of viral diseases including H5N1 bird flu, seasonal influenza, HIV, EKC/herpes (epidemic kerato-conjunctivitis or severe pink eye disease), hepatitis C, rabies, dengue fever, and Ebola virus, among others. This interview contains forward-looking statements that reflect the Company's current expectation regarding future events. 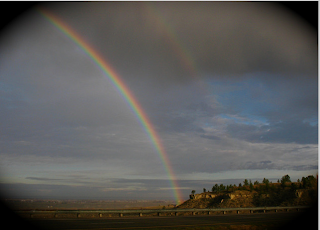 Forward-looking statements involve risks and uncertainties. Actual events could differ materially and substantially from those projected herein and depend on a number of factors. Certain statements in this release, and other written or oral statements made by NanoViricides, Inc. are “forward-looking statements” within the meaning of Section 27A of the Securities Act of 1933 and Section 21E of the Securities Exchange Act of 1934. These forward looking statements are subject to known and unknown risks, uncertainties and other factors that may cause actual results, performance, or achievements of the company to be different from those expressed or implied including the success of the Company's research and development efforts, the availability of adequate financing, the successful and timely completion of clinical studies and the uncertainties related to the regulatory process, described in the “Management’s Discussion and Analysis” section of the Company’s Form 10-KSB and other reports and filings with the Securities and Exchange Commission. #1) You have been talking about discussions with various big pharmas. Why don’t you have a pharma deal done? The glacial pace of my pharma negotiations has been a major source of frustration for me. It took me a long time to understand why these pharmas move so slowly. They’re just VERY large bureaucracies. Most all have adopted a new procedure when evaluating "deals" with outside biotechs. This process requires extensive analysis by outside business consultants. Following their report, there are a number of internal hurdles that still must be bridged. Most internal people are not interested in increasing their workload and they tend to drag their feet when it comes to new deals, especially when these deals are related to new technologies. Many of these lower level people have no significant stake in the financial success of their employer. It appears to me that these relationships may take at least one to two years to solidify. One year has just passed! The Japanese pharmas are even more risk averse and slower to act than the Americans. They are awaiting the test results from our collaborator in Tokyo. He himself is awaiting hospital approval to begin the necessary studies. However, we did report on November 10th that we had presented at an international ophthalmology meeting. This was the first meeting in which we had made a presentation whose attendees were all clinicians. We had a very positive response from that presentation. Two of the previously most interested pharmas had representatives in attendance for our talk. The tenor of our discussions have now heated up because of that presentation. Nothing like the fear of potentially losing a deal to spur people on! #2) What about large Foundations such as the Gates Foundation? We have contacts at the highest levels of the Gates Foundation. Their focus now is on HIV, malaria and tuberculosis. When we complete the next set of studies on HIV, I plan to approach them. It’s all about the data! I don’t want to compromise my chances of success by going in to see them too early, without a complete data set! #3) You had frequent announcements in the summer and it’s quieter now. Why? h) Dengue (Walter Reed Army Institute of Medical Research plus 2nd location). All of the above, except f and g, once approved, have significant revenue potential. #4) The website is out of date. When will you have a new site? The new website has been completed and is now undergoing quality review. It has a number of features that people have asked for including a better explanation of the nature of the technology. This is always a problem because one can never be certain about how the technology works at the 20 nm level. That’s twenty billionths of a meter! Also, if you claim mechanism of action, the FDA can make you prove it. That merely extends the approval process. Personally, I only care that it works! #5) In the past, you’ve spoken about moving from Connecticut to new facilities which also can serve as manufacturing facilities. We’ve received financial offers from two States and are awaiting a third. I hope to make a decision by the end of the year. State money will help move us more rapidly to my goal of revenue in the veterinary world in the next 18-30 months. Achieving that goal is predicated upon a number of factors, not the least of which is funding for the prototype pilot as well as the toxicology studies, necessary for submission to both the human FDA side as well as to the Center for Veterinary Medicine at the FDA. 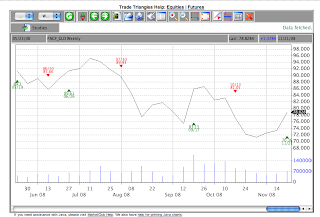 Note that today, the Daily Q chart triggered a SELL signal after standing aside from the previous BUY Triangle. All MC systems are now back aligned on the Short side of the market. I've drawn in a wedge or triangle formation that has been developing over the past five weeks. Including after hours trading today, Google fell 10%. Is this a selling climax, or the beginning of a new leg down? A selling climax is defined as trading to a new intra-day low but closing up for the day. Clearly, Google's drop today was not a selling climax. That leaves one alternative, the beginning of a new leg down. 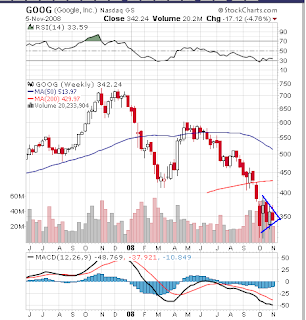 Breaking and closing below that lower trend line in the annotated chart above would represent an extremely bearish pattern, suggesting new 52 week lows ahead for Google. That would be a drop to under $310 and probably well below $300. There you have it, the market's recent counter-trend rally seems to have run it's course and path of least resistance is down. It’s been a long time since a politician has impressed me. For the most, they occupy the step on the ladder of morality just below that step reserved for attorneys. But this one, he is different. So different in fact that he reminds me in so many ways like the first (and last) politician who I admired, John F. Kennedy. What is it that connects these two? First, they know how to speak in such a way that you listen. Their words are not simply tools to pick your pocket and bank account, but to touch your heart and soul, to remind us that we are here at a special time in the course of the world, the years occupied by our presence on Earth and our effect upon society and upon each other. Barack Obama speaks to me. His speeches, all self-written, do not for the most part merely attack John McCain. In fact, in most of Obama’s major speeches, he hardly goes to that well. In his recent half hour of a paid television advertisement, he did not mention his opponents with a single reference. What kind of man spends that kind of exposure and those kinds of dollars and doesn’t take a swipe at his opponent? A decent man. A man so full of new ideas and new ways of dealing with our place in the course of history that 30 minutes could hardly be enough time to explain his view of our world and our role in this special time and place. I have been around since about the middle of the last century. During these years there have been precious few decent men who asked me for my vote for President. I was too young to vote for JFK. I wasn’t given the privilege to vote for his brother Robert, but I did cast an anti-war ballot for George McGovern. Since then, the body of candidates who have emerged from the cesspool of party politics were more or less mediocre and ambitious relics of a political system based on greed, power and spoils that inure to the winners. The fringe candidates, well they were just that, fringe candidates. So what was left? Angry and disappointed, what was left was my own personal boycott of the process. Yea, I certainly taught them a lesson. This time he is different. His voice and his vision are different. His words empower me to do better. His ideas compel me to think about how good we can be as a society and how much I can make a difference in my small slice of life and presence on Earth. I remember those feelings, they were the same ones that appeared on my screen as a ten year old kid in Detroit, circa 1959, when this strange sounding man from Boston captivated the good in me and encouraged me to start paying attention to the bigger picture in my life and my role in it. He made me want to be better, be all that I could be, contribute to making my world a better place and not want nor expect anything in return other then the satisfaction that we did make a difference, a positive difference and all was not in vain. Barack Obama has rekindled those aspirations in me. I am no longer an innocent ten year old. I am closer to the end, then the beginning of my reign on Earth. But unlike then, I am now old enough to vote, old enough to be a part of this voice for change and old enough to be proud and privileged to be a part of history. Because this one, he is different, because this one reaches that little boy of ten, because this one makes this man in his fifties feel that he can make things better with a single vote, because of this, I am voting Tuesday, for Barack Obama.